The holidays have long since passed and each year I find it interesting and refreshing to see the productivity of our society after the holidays are over and things come back to order. Many people have New Year’s resolutions and are taking actions to make their lives better after the holiday slow down. This is where I always say that rest and relaxation can lead to great reflection. That reflection is often needed for people to step out of the daily grind and realize what can be done for self-improvement on a journey to achieve a better quality of life. Here at Premier Innovations Group, I could not be more optimistic or humbled by the profound movement of our productive family as we surge into the first quarter of 2013. This year will be filled with amazing growth and life changing events that stem from great corporate care and culture for our Premier team, our supporters and the general community that surrounds us. Our corporate focus this year is “Creating action, while being aware and responsible culturally and continuing to hold our high corporate standards”. That’s what 2013 has in store for us. We look forward to action at its best. Total team commitment to create action is the focus. In 2012 we sacrificed together and we made our big move that enabled the Clique Vodka facelift to “the new black”. Only a few months after the launch and in the first month of 2013, we already feel an overwhelmingly positive response from our supporters, foreshadowing eminent long term success. I could not be more proud of where we have come from and where we are going. The question is: where are we going and what can be expected as a customer, supporter, investor or just a spectator in our movement together? Things are heating up as global interest grows for our product and long term relationships are being solidified that represent big wins in an ever changing global sprits landscape. We have positioned ourselves at the helm and forefront of something different and incredible. With unprecedented value, my biggest sales virtue starts to take life now. Empowerment, great culture and amazing people are the drivers of the vision that will begin to unfold with game changing wins in 2013. We have finally worked out the logistics with the Pennsylvania Fine Wine & Good Spirits stores with the help of the people working within the Pennsylvania Liquor Control Board. I’m proud to say we are making progress in leaps and bounds by having our new black Clique Vodka bottles in every store in the state and to never see a store sell out of our product. We want to express our appreciation for everyone’s patience throughout this transition. The road has been long with many turns, but we are better logistically than ever before. West Virginia has also fully transitioned to the new bottle and we have had an amazing nationwide response to Clique Vodka through our partnership with Total Wine & More. Consumer interest and responses spanning over 20 states and many new countries are abundant. Inquiries to partner with our company are overwhelming and at an all-time high. We can’t thank everyone enough for getting involved and reaching out to our movement in any way. We remain transparent, humble and ready to work and communicate with achievers around the world. We have pending deals in Japan, Puerto Rico, the Dominican Republic and several other countries. Two broker agreements to expand into another 15 states are on the horizon. There is much interest in purchasing and opening new territories. Great communication, relationship building and efficiency form the foundation that will continue to lead us through. Our goal is to be in over 30 states by the end of 2013. I’m proud to say we will be strong in well over three countries by the end of the year as well. We are on track to grow our business by at least four-times the gross revenue of 2012. That’s explosive growth in a less than forgiving economy. We are always looking to give our customers more. We have an interest in launching several new brands with the expansion of flavors and different size bottles of Clique Vodka. The import, export and logistics services of our company grow stronger everyday as we continue to successfully navigate the global alcoholic beverage producing landscape. We have proven that we are capable of creating anything in the alcoholic beverage industry and in 2013 we look to further extend our importation and brand creation services to others, while maintaining the integrity of our own in-house brands. As we continue to grow and change, we want to sincerely thank everyone involved in our movement. We want to once again encourage the public to get involved and be part of our wonderful business. At Premier, we would like to wish everyone an amazing 2013 filled with positive achievements leading to incredible changes and memorable life events. Within the creation of these memorable events, alcoholic beverages for those of age often are included to enhance the experience. We want to encourage others to drink our fine products and we will continue to assure the best quality money can buy. Once again, I want to remind everyone as I always do, that drinking alcohol is to be taken seriously and can lead to dangerous matters when not handled cautiously. In closing, as we embark on 2013, we must all remember to drink Don Pantaleon Tequila and Clique Vodka intelligently. 2012 has flown by like a whirlwind filled with unprecedented growth, preparation and activity. For us at Premier it represented taking a step back demonstrating preparation, patience and sacrifice. These cultural musts lead us two steps forward that will start to become recognizable and culminate in these last three months of 2012. We made a bold decision with our flagship brand, Clique Vodka, to completely change the packaging and not purchase any more of the old components. This may create a manageable risk that we face in October of being short to meet the demand for the product remaining. We ask for understanding amongst our consumers and supporters in our territories for the transition and we want to stress the reason for this change. Sales grow stronger everyday throughout Pennsylvania, Ohio, West Virginia and Tennessee. August was our biggest month ever and Clique Vodka out sold many well-known giants in the industry. With that being said, it does not change our main goal, which is to provide award-winning quality with award-winning esthetics translating into exceptional packaging at an unbelievable price. Incredible value is what sets us apart and with this latest change, I feel confident promising that to you, our consumer. With the big medal wins for formulation the product formula will stay exactly unchanged throughout. The package we are about to unveil is a complete and dramatic facelift boasting an exclusive decorative bottle that we feel will be a true game changer in the spirits industry. The new face lift is upon us, as a large shipment of new finished product leaves Latvia landing in the United States in early November. Over 20 states, Puerto Rico, Dominican Republic and Japan are all awaiting product. Negotiations in Spain, Canada, India and several other countries continue. Everyone is excited and ramping up resources to represent the new Clique Vodka. In November we will be unveiling this masterpiece. We look forward to your presence at events as well. Fiscally we will do more sales in three months then we did for the whole first nine months of the year pending all of the accumulated orders for the new bottles. We are proud of the accomplishments and could not be more optimistic with the sales projections leading towards the start of a banner year in 2013. It is eminent that it will be a huge revenue year in comparison to the last start up year. Premier is also in the stages of expanding our portfolio with several new brands for 2013. We can guarantee that they will be trend setters with unprecedented value. We always have only the best for our consumers in mind. Announcements will proceed at the beginning of 2013. The Premier team grows everyday with more brand ambassadors and promotional help. We are proud of the size and impact our business is starting to have as a corporate and socially responsible company in the community around us. We continue to contribute, and over the summer participated in over 200 charitable events to support our communities. We will never stop supporting and with ethics and integrity we will continue to do our best to be a great company to work with and for. With autumn upon us it makes me think of warm fireside nights with loved ones. It is often great to warm up with a fine fall libation. Here at Premier we know that with the consumption of alcohol there are risks and dangers. As I always mention we expect and ask our consumers to Clique intelligently and Drink Don dubiously while enjoying the fall Season. With the explosive fall growth upon us we want to encourage you to join us and be part of it. 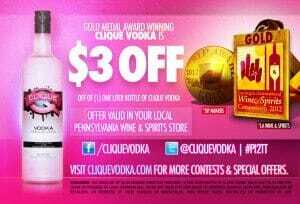 Clique offers month-long promotion for their award winning vodka. 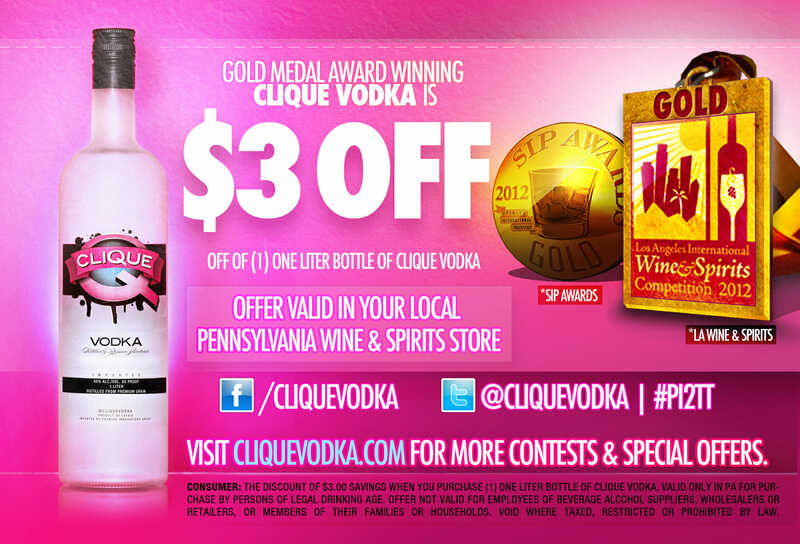 Pittsburgh, PA (August 1, 2012)—Starting today, August 1st, Clique Vodka will be offering a $3.00 discount in the state of Pennsylvania on their one liter bottles valid August 1 – 26, 2012. Clique Vodka will retail for $12.99 at Fine Wines & Good Spirits stores across the state. The promotion will already be available and will be honored when purchasing the product. On pallet entry, Clique has a bold, creamy flavor reminiscent of Russian vodkas, but has a smooth, light sweetness on the finish with no burn to the throat. The formula gives it the components of an imported Eastern European traditional brand with the aftertaste of a crafted, limited batch vodka. Pittsburgh, PA (April 17, 2012)—Premier Innovations Group has launched it’s top brand Clique Vodka in the Philadelphia market. This will allow Premier Innovations Group to have complete state coverage of their brand in Pennsylvania. “We couldn’t be happier with our expansion to the eastern side of the state. Launching Clique Vodka in Philadelphia is part of our company’s continued success to expand our reach and customer base.” says Noah Cohen, CEO Premier Innovations Group. Premier Innovations Group holds their headquarters in Pittsburgh, PA, but that will not effect the sales efforts in Philadelphia. The hiring of a Philadelphia-based brand ambassador was filled, and his main role is to build strong relationships with all service industry accounts, as well as, continuing Clique Vodka’s strong community involvement. The Clique Vodka team is very proud of the quality of their product and the excitement of being a young, fun, and aggressive brand targeting the Philadelphia market with a strong social media presence and interaction. Clique Vodka is available in over 600 Fine Wine & Good Spirits stores all across Pennsylvania. You can also find Clique in Drexel Hill, Doylestown, Media, and other surrounding areas. 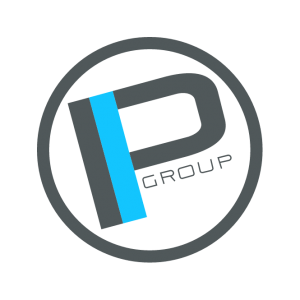 Premier Innovations Group is a multi-faceted spirits importing company that develops their own private label liquor brands and markets them with fusion of viral event-driven entertainment, art and design. Generation of revenue comes from private label vodka and tequilas, importing for other companies on royalty retainer and promotional event billing income for service industry accounts. Expansion and growth of these brands throughout the US is our focus. Premier Innovations Group is well on their way to becoming an industry leading beverage importing, brokering and promotions company.